Looking for a New Mercedes-Benz C-Class in your area? CarGurus has 389 nationwide Mercedes-Benz C-Class dealers with 34,657 new car listings. While plenty of compact luxury cars offer ample standard and available features, few do it with the elegance and style of the 2018 Mercedes-Benz C-Class. The C-Class has been sold in North America since the 1990s as a popular luxury compact car. Available throughout the years in coupe, sedan, convertible, and wagon variants, the C-Class has proven its flexibility into the current generation, which was introduced for the 2015 model year. It is carried over to the 2018 model year, with some small, yet thoughtful, tweaks. Like the rest of the Mercedes-Benz lineup, the C-Class is intended to evoke the styling of Mercedes-Benz’s top-end models, like the ultra-luxurious S-Class sedan. In the case of the C-Class, this school of styling is embodied in a large, cowl-like grille, flanked by headlights that flow up into a large crease that runs along the beltline of the car, fading near the rear wheel arch. The taillights flow smoothly into the rear bumper, much like those on the S-Class. All the grace and elegance of the C-Class’s exterior is carried to the cabin, where a wealth of standard and optional features are packaged in smooth, simplified layout. The C-Class has comfortable, spacious front seats. Rear seat area is somewhat limited, a common attribute for the class. Compared to past iterations, the C-Class has a simple engine lineup. 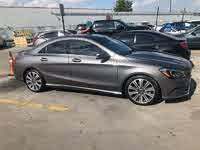 The standard C300 features a turbocharged 2.0-liter inline-4 that makes 241 horsepower and 273 pound feet of torque. Power is routed to a new 9-speed automatic transmission, replacing the 7-speed unit from the 2017 model. The C300 is available with rear-wheel drive (RWD) or with 4MATIC all-wheel drive. Mercedes-Benz also offers a hybrid drivetrain, in the form of the C350e. It combines the turbocharged inline-4 from the C300 with electric power, to make a net output of 275 horsepower and 443 pound-feet of torque. This engine continues to use the 7-speed automatic and is RWD only. According to Mercedes-Benz, this drivetrain also provides up to 8 miles of electric-only driving. Standard features for the C300 include 17-inch alloy wheels, power sunroof, power front seats with driver’s seat memory settings, dual-zone automatic climate control, Bluetooth streaming audio, dual USB ports, and a high-resolution in-dash screen with Mercedes-Benz’s COMAND infotainment system. Fuel economy with the base C300 is 24 mpg city, 33 highway, 27 combined. The C400 4MATIC returns 23 mpg city, 32 highway, 26 combined. The hybrid C350e has fuel economy of 28 mpg city, 32 highway, 30 combined, and a mile-per-gallon equivalent (MPGe) of 51 combined. 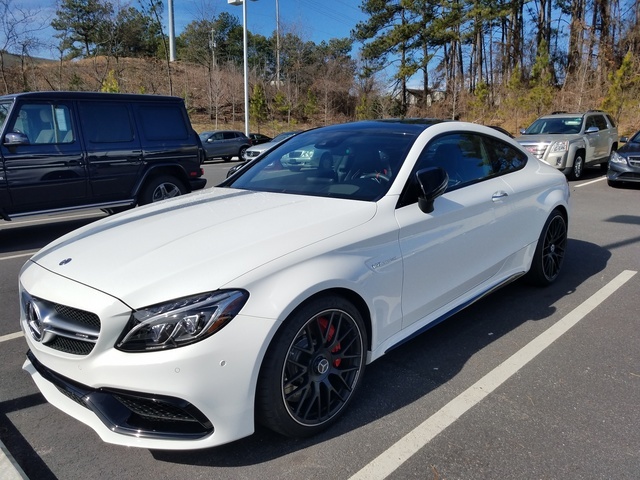 For drivers interested in higher performance, there are several Mercedes-AMG vehicles available, including the C43, C63, and C63 S. The AMG C43 features a twin-turbo 3.0-liter V6 that puts out 362 horsepower and 384 pound feet of torque. The AMG C43 comes standard with 4MATIC all-wheel drive. The AMG C63 features a twin-turbocharged 4.0-liter V8 engine, producing 469 horsepower and 479 pound-feet of torque. On the C63 S, the engine produces 503 horsepower and 516 pound-feet of torque. A 7-speed AMG transmission powers the C63 with standard rear-wheel drive. According to Mercedes-Benz, the C63 S will go from 0 to 60 mph in just 3.9 seconds. It also has an electronically-limited top speed of 180 mph. As the AMG models go, the C63 returns 20 mpg city, 27 highway, and 23 combined. Moving up to the S model, those numbers fall to 18 mpg city, 24 highway, 20 combined. The C-Class comes standard with a reversing camera, nine airbags, dynamic cornering assist, and a tire pressure monitoring system. It also comes standard with advanced safety equipment, such as forward-collision warning and avoidance, and Attention Assistant, which can notify drivers with visual and audio cues if it senses fatigue. The C-Class is also available with lane-departure warning, active high beams, adaptive cruise control, blind-spot warning, cross-path detection system, and 360-degree camera. The Mercedes-Benz is more than just an attractive compact luxury car. 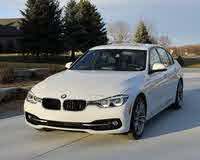 It delivers the latest in-car and safety tech, and provides an upscale cabin experience. What's your take on the 2018 Mercedes-Benz C-Class? Users ranked 2018 Mercedes-Benz C-Class against other cars which they drove/owned. Each ranking was based on 9 categories. Here is the summary of top rankings. Have you driven a 2018 Mercedes-Benz C-Class? Enter your zip to see incentives for a new C-Class in your area. Can I still listen to my radio when I have the media button pressed and using GPS through my phone?